This is a list of asteroids whose names are known to have a Canadian connection, usually because they are named after a Canadian. This resource was created by Peter Jedicke, and is now curated by Eric Briggs. Where the citation given here expands upon the official citation, the added material was edited by either Peter or Eric, who are solely responsible for any errors or omissions. Note that for some asteroids, particularly more recent designations, the short, official citation is included on JPL's orbit applet page. Typing part or all of a name in the quick search box allows you to quickly find a particular asteroid. 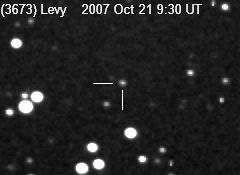 Clicking on the asteroid number will take you to the Jet Propulsion Laboratory's orbit applet. Clicking on any asteroid name will show you full information about that asteroid, including an expanded citation. Clicking on the asteroid designation will take you to the IAU MPC page for that asteroid. Clicking on a table heading will sort by that column (click again to reverse that sort). Type part or all of a name. Displaying 31 - 40 of 508 asteroids (page 4 of 51).